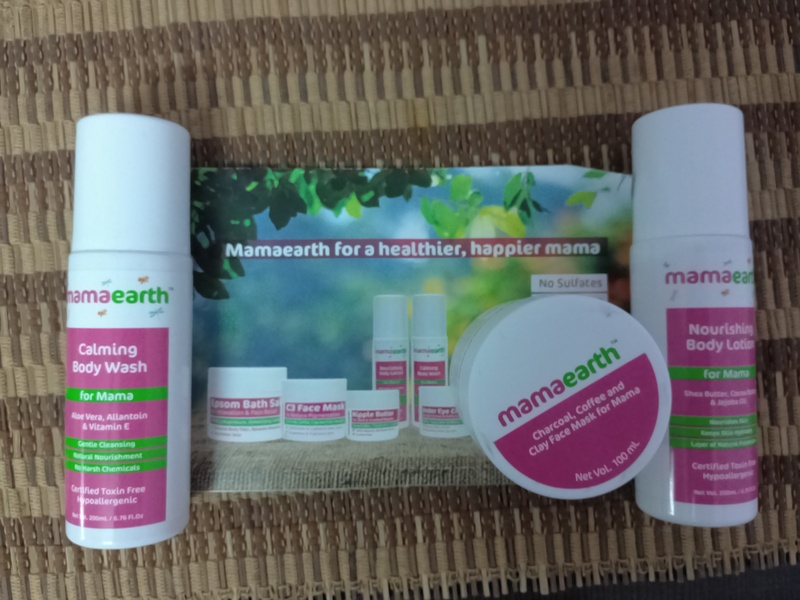 Sometime back I started using Mama Earth products for my daughter. The baby care product range is so soft and gentle that I immediately fell in love with it. The products are completely toxin free and have no harmful chemicals in them. The gentle and pure nature of the products made me wonder if only I could get to use some products of the similar nature for myself. If only there could be some product range for mothers which is also toxin free and has no harmful chemicals. Even if we try to use some “natural” or “herbal” products for ourselves we can never be sure that these are 100% natural or safe for our skin. But Mama Earth seems to have captured me thoughts. They have come up with an entire range of care products for mothers too. Just like the baby care range, this new range of products, which has been especially designed for expectant and new mothers, is also 100%natural and toxin free. I was shocked to know that more than 200 chemicals were found in the umbilical cord as suggested by a study. Of course, we do not want that for our babies. 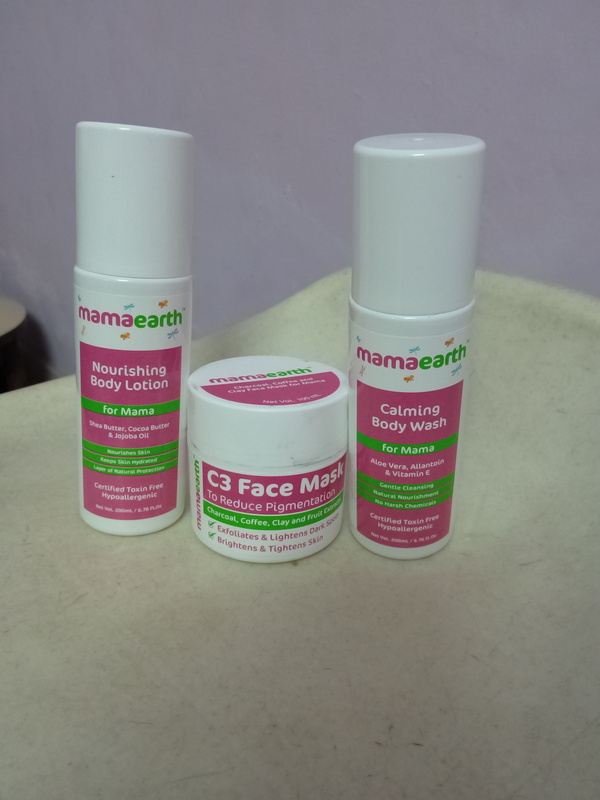 Recently, I received a kit by the brand containing Mama Earth Calming Body Wash, Mama Earth Nourishing Body Lotion and C3 Face Mask. 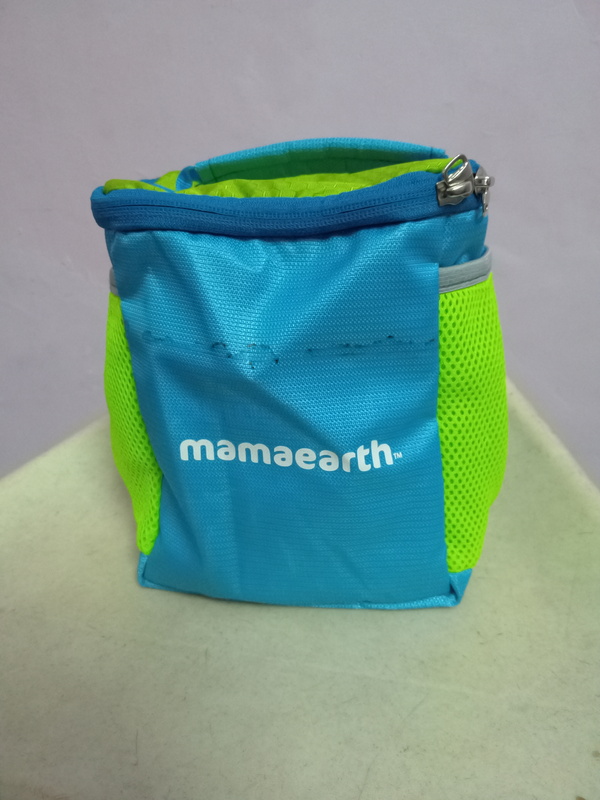 The kit comes in the form of a beautiful multipurpose blue and green bag with several pockets ideal for travel purposes. The soft white packaging of the products is very eye catching. Like the baby care range, this range is also free from sulfates, parabens and mineral oil. I tried all the products and am sharing a review of the products that I received. This face mask is what I liked the most. It has charcoal, coffee and clay. It is loaded with minerals like magnesium, calcium and potassium. It helps stimulates blood circulation. It has aloe vera which helps in reducing melanin in the body. Its main ingredient coffee helps in stimulating blood flow and removes toxins which further helps in reducing blemishes. The mask has a soft and creamy texture. After applying, it has a very cooling effect on the skin. The cooling effect is extremely soothing in the prevailing summer heat. The mask can be applied for ten to fifteen minutes. It does not leave the skin dry, rather makes it soft and supple. The cooling lasts for quite some time. The glow which it brings on the skin is very noticeable. The Calming Body Wash has natural ingredients like Aloe Vera, Shea Butter, Cocoa Butter and Geranium Essential Oil. A little quantity is sufficient to make good lather. The body wash is very soft and gentle. It has an awesome fragrance lasts for a longer time. The body wash does not make the skin dry. It helps in maintaining the natural moisture of the skin, leaving it soft and supple. Just like the Body Wash, the Nourishing Body Lotion also contains natural ingredients like Aloe Vera, Shea butter, Cocoa Butter and Geranium essential oil. It is free from mineral oil. It is non-greasy and non-sticky. It is a thin liquid which spreads easily and gets immediately absorbed in the skin. It leaves the skin hydrated and well nourished. The smooth and soft feeling on the skin lasts for a very long time. The products are to be applied in very little quantity and their effect lasts longer, thus they become cost friendly. All in all, I found the products very appealing and pocket friendly. Hi .. I would like to know the cost for C3face Mask.. wanna give a try ..Thank you..